For its STS-124 mission, shuttle Discovery was transferred from its hangar to the Vehicle Assembly Building for attachment to a fuel tank and twin solid rocket boosters. The Complex 40 mobile service tower at Cape Canaveral's former Titan rocket launch pad was toppled using explosives on April 27. Using data from NASA's New Horizons spacecraft and two telescopes at Earth, an international team of scientists has found that one of the solar system's largest and newest storms - Jupiter's Little Red Spot - has some of the highest wind speeds ever detected on any planet. New Horizons researchers combined observations from their Pluto-bound spacecraft, which flew past Jupiter in February 2007; data from the Hubble Space Telescope orbiting Earth; and the European Southern Observatory's Very Large Telescope, perched on an Atacama Desert mountain in Chile. This is the first time that high-resolution, close-up imaging of the Little Red Spot has been combined with powerful Earth-orbital and ground-based imagery made at ultraviolet through mid-infrared wavelengths. Jupiter's "LRS" is an anticyclone, a storm whose winds circulate in the opposite direction to that of a cyclone - counterclockwise, in this case. It is nearly the size of Earth and as red as the similar, but larger and more well known, Great Red Spot (GRS). The dramatic evolution of the LRS began with the merger of three smaller white storms that had been observed since the 1930s. Two of these storms coalesced in 1998, and the combined pair merged with a third major Jovian storm in 2000. In late 2005 � for reasons still unknown � the combined storm turned red. The new observations confirm that wind speeds in the LRS have increased substantially over the wind speeds in the precursor storms, which had been observed by NASA's Voyager and Galileo missions in past decades. Researchers measured the latest wind speeds and directions using two image mosaics from New Horizons' telescopic Long Range Reconnaissance Imager (LORRI), taken 30 minutes apart in order to track the motion of cloud features. New Horizons obtained the images from a distance of approximately 2.4 million kilometers (1.5 million miles) from Jupiter at a resolution of 14.4 kilometers (8.9 miles) per pixel. The LRS' maximum winds speeds of about 384 miles per hour far exceed the 156 mile-per-hour threshold that would make it a Category 5 storm on Earth. "This storm is still developing, and some of the changes remain mysterious," says Dr. Andrew Cheng of the Johns Hopkins University Applied Physics Laboratory (APL), Laurel, Md., who led the study team. "This unique set of observations is giving us hints about the storm's structure and makeup; from this, we expect to learn much more about how these large atmospheric disturbances form on worlds across the solar system." Jupiter's venerable Great Red Spot has decreased steadily in size over the past several decades. In addition, a rare "global upheaval" in Jupiter's atmosphere began before New Horizons visited last year. This upheaval involved the disappearance of activity in the South Equatorial Belt (which left the GRS as an isolated storm), the appearance of a south tropical disturbance north of the Little Red Spot, and other spectacular cloud changes. 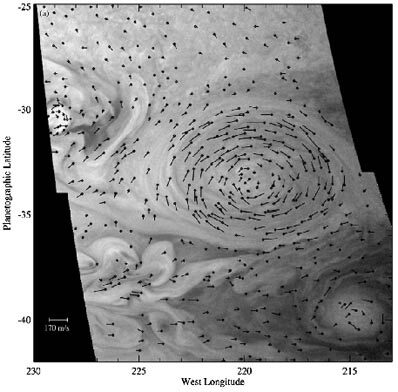 "This was a rare opportunity to combine observations from a powerful suite of instruments, as Jupiter will not be visited again by a spacecraft until 2016 at the earliest," says Cheng, whose team publishes its work in the June 2008 Astronomical Journal. Scientists combined LORRI maps of cloud motions with visible-color images from Hubble, and mid-infrared images from the Very Large Telescope. The latter technique allows scientists to "see" thermal structure and dynamics beneath the visible cloud layers, because thermal infrared wavelengths (indicating heat) can pass through the higher clouds. "The new observations confirm that the thermal structures, wind speeds, and cloud features of the LRS are very similar to those of the GRS," says Dr. Hal Weaver, a member of the study team from APL and the New Horizons project scientist. "Both the LRS and the GRS extend into the stratosphere, to far higher altitudes than for the smaller storms on Jupiter." The observations offer clues to the mystery of why the GRS, and now also the LRS, may be so red. The wind speeds and overall strength of the LRS increased substantially in the seven years between the Galileo and the New Horizons observations, during which the storm became red. "This supports the idea that a common dynamical mechanism explains the reddening of the two largest anticyclonic systems on Jupiter, one possibility of which is that storm winds dredge up material from below," says Dr. Amy Simon-Miller of NASA's Goddard Space Flight Center, Greenbelt, Md. In their report, the scientists also wonder about the future of Jupiter's two giant storms. The LRS already rivals the steadily shrinking GRS in size and wind speed. The new thermal and wind field observations hint at an interaction between the south tropical disturbance, the Little Red Spot, and a warm cyclonic region south of the LRS, forming a complex that could dwarf the Great Red Spot. 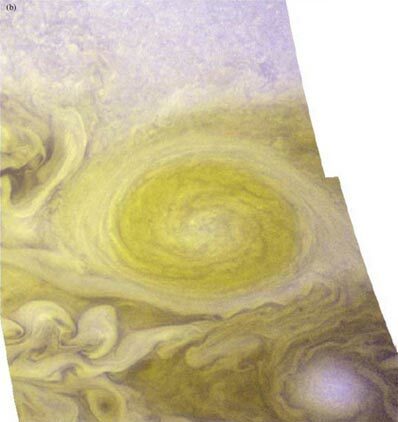 "The Great Red Spot may not always be the largest and strongest storm on Jupiter," says Dr. Glenn Orton of NASA's Jet Propulsion Laboratory, Pasadena, Calif. "Continued monitoring of Jupiter's constantly evolving atmosphere will surely yield more surprises." New Horizons is the first mission in NASA's New Frontiers Program of medium-class spacecraft exploration projects. Dr. Alan Stern leads the mission and science team as principal investigator; APL manages the mission for NASA's Science Mission Directorate. The mission team also includes Southwest Research Institute, Ball Aerospace Corporation, the Boeing Company, NASA Goddard Space Flight Center, NASA Jet Propulsion Laboratory, Stanford University, KinetX Inc. (navigation team), Lockheed Martin Corporation, University of Colorado, the U.S. Department of Energy, and a number of other firms, NASA centers, and university partners.